Sandra Bullock's son Louis (Pacific Coast News)Arrrrrr! 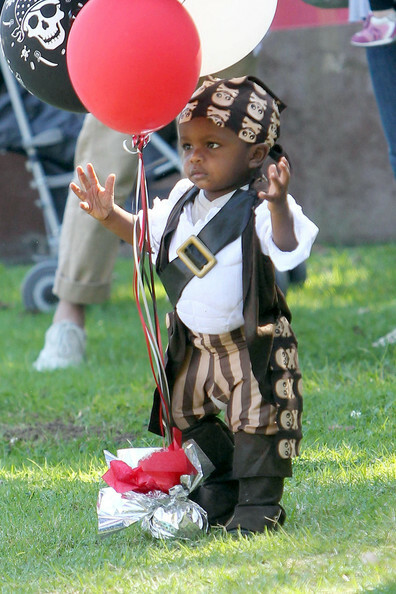 Sandra Bullock and her two-year-old son Louis put on their best pirate garb for a birthday party over the weekend. The adorable tot wore a skull and crossbones bandana, striped pants, pirate boots, and a swashbuckler belt. Sandra also got into the pirate themed fun with a large hat. Louis had fun playing with balloons, running around the park, and jumping in the bounce house with Bullock. We assume he also took home some pirate booty in the form of a party favor bag. Sandra is enjoying some downtime with her family before she jumps into promoting her new filmExtremely Loud and Incredibly Close, which also stars Tom Hanks.